There are two Disney movies I loved watching as a tiny Luzanne – ‘The Little Mermaid’ (I remember walking out of the cinema with tears streaming down my face) and ‘Beauty And The Beast’. I loved the idea of someone being able to see past the physical attributes of someone, and fall in love with who they are as a person. Sure, it’s a little bit strange for a human to fall in love with someone who is half-animal but in the end he returned to his former self – a handsome young Prince. I guess that’s also why I really enjoy the storyline of ‘The Hunchback Of Notre Dame’. The world would be a much better place if we were all more accepting, and no one cared about race, religion, sexual preferences, how someone looks or dresses etc. because in the end, all that really matters is if someone is a good person…right? These days I don’t really watch animated movies, but the aforementioned movies will always have a very special place in my heart. I was so excited when I read earlier last year that a remake of ‘Beauty And The Beast’ was in the making – I love Emma Watson (although she’ll always be little Hermione to me) and so I made a mental note to go watch the movie as soon as it arrived on the big screen. I haven’t had time to visit the cinemas yet, but I might go this coming weekend as Neal will be in Clarens taking part in a mountain bike stage race. I always get a grape Slush Puppy when I’m at the movies…hhhmmmm…how about you? 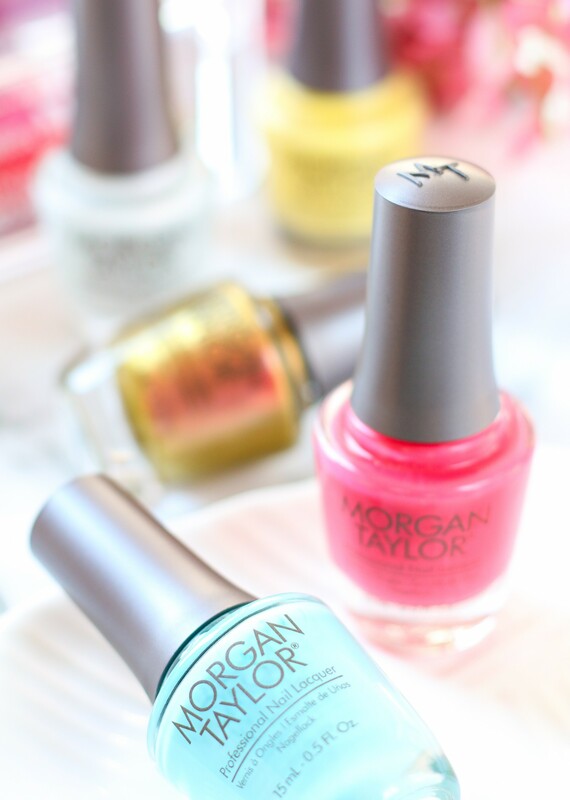 Anyway, so Morgan Taylor recently launched their new limited edition collection called ‘Beauty And The Beast’. 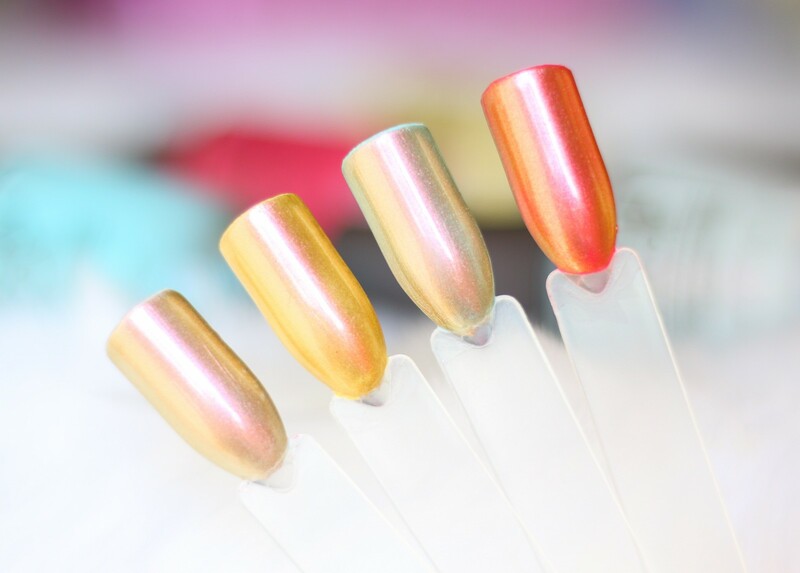 The collection features 7 nail polishes – 5 cremes, 1 metallic, and 1 specialty topcoat. Today I’ll be reviewing 5 of the 7 nail polishes – some of which were sent to me, and others were bought at Dis-Chem by moi. I really like this collection, all the colours are right up my alley – bright, cheerful, and suitable for any occasion. If I had to choose 2 favourites, it would definitely be: Days In The Sun (yellow) and Potts of Tea (alabaster) – both are quite unique as they have this iridescent, pearly shift to them. Please do me a favour: I worked really hard on the swatches below – I tried something different and applied the nail polishes to my nails (instead of the swatch sticks I usually use). Please provide me with some feedback and let me know if you prefer seeing nail polish swatches on my actual nails – as you can imagine, it takes a lot of time to apply 2 or 3 coats, clean up around the nail bed, take photos, and then edit each photo. Trust me, it’s a lot quicker and easier for me to use swatch sticks BUT I want my blog posts to be helpful and worth your time. So I would really appreciate it if you could leave a comment below to let me know if you want me to continue to show swatches on my nails. Potts Of Tea – A cool off-white sprinkled with a rose shimmers and a gold micro flake glitters. I applied 3 coats to achieve full opacity (but if you have super smooth nails, I imagine 2 coats will be just fine). The addition of the glitter flakes and shimmers was a great idea – if you catch this nail polish in the right light, the pretty soft pink sparkles are very noticeable (and yet, it’s still a very wearable nail polish that is suitable for the office). When I look at ‘Potts Of Tea’, I imagine it matches Mrs. Potts perfectly! The grey-toned white base to mimic the look of a fine china tea pot, with the pink iridescent glitters to tie in with her lady-like personality. Days In The Sun – A perfect mix between a bright- and a pastel yellow (it reminds me of daffodils) with a shimmery rose sheen. This one also required 3 coats to even out – but remember, I have slight ridges on my nails so I like to apply an extra coat to get a fully opaque finish. I don’t wear sunny yellow nail polishes all that often because some of them tend to make my skin look like I have liver disease. Fortunately ‘Days In The Sun’ suits my skin tone perfectly and actually brightens up my pale skin. I’m sure we can all agree that ‘Days In The Sun’ matches the gorgeous ballgown Belle wore in the movie perfectly. Gaston And On And On – A bright pastel blue creme that reminds me of a clear blue sky on a cold Winter’s morning. This one also has a great formula and is fully opaque in just 2 coats. Pretty, isn’t it? Be Our Guest – A bright pink (almost fuchsia) creme polish with a slightly cool undertone. This nail polish can be opaque in 1 coat but for the swatches above I applied 2 just to be safe. It has a lovely formula, easy to apply and super creamy. I can see ‘Be Our Guest’ being a fan favourite because this type of pink is classic, use it as a manicure or pedicure shade for casual days or weekdays at the office. Enchanted Patina – An antiqued gold nail polish topper that shifts between a tarnished gold and a rose gold. If MAC ‘Old Gold’ pigment and MAC ‘Antiqued’ eyeshadow had a baby (in the form of a nail polish), then this would be it! ‘Enchanted Patina’ is a topcoat and it antique-ifies (that’s not really a word, is it?) any nail polish colour it is applied on top of. I’ll be honest: I prefer this as a nail polish that is used as-is (not as a topper). I think it takes the beauty away from other brighter nail polishes (see the swatch photo above), plus I found it to be streaky when applied on top of other nail polishes. When applied as a stand-alone polish, it is fully opaque (and non-streaky) in just 2 coats. This is a really nice colour for the Autumn and Winter months ahead! There are 2 other nail polish colours in the collection – a metallic ruby red shade and a stunning baby pink shade. I think I might go back to Dis-Chem today to get the pale pink one! 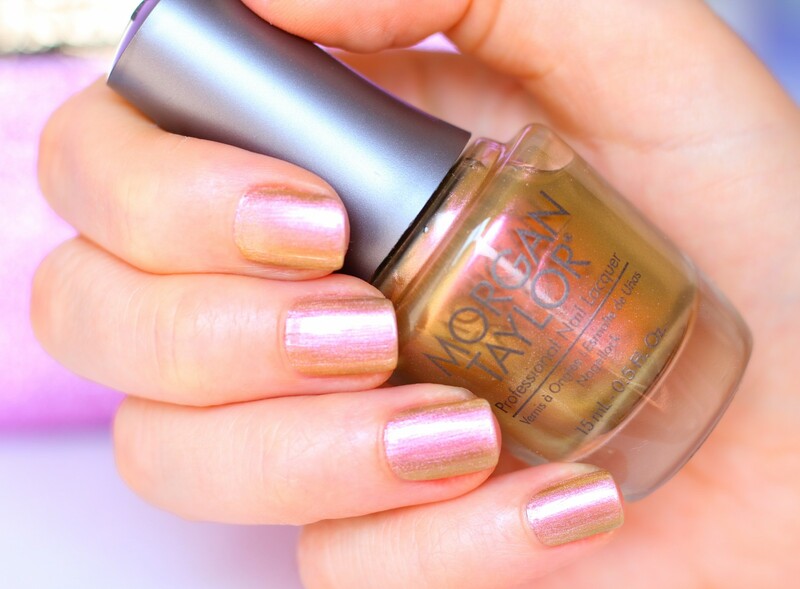 The Morgan Taylor ‘Beauty And The Beast’ collection is available at Dis-Chem stores nationwide right NOW (or online at Takealot.com), and the nail polishes retail for R145,00 each. You can also purchase a mini set of 4 collection nail polishes for R255,00 (which is way better value for money). I was so excited to get these, so I got the mini set and days in the sun (which is the actual one I was eyeing). I used Days in the Sun and I hated it. I find MT nail polishes, usually 2 coats is quite sufficient. I filed ridges down and still 2 coats looked awful. So I'm glad to see I'm not crazy….I didn't think to do 3 coats…silly me. It's a stunning colour so I'll give it another chance. I find all of them require 3 coats as I did 2 and was not happy with them. I don't have that blue one…also very pretty. Hi Simone! 🙂 Aaaack! I have such bad ridges on my nails (it’s because of chronic medication I have to take) and I find I have to file & buff the surface of my nails just a little bit to even it out, and then apply 2 to 3 thickish coats of a nail polish. That’s the only thing that evens out the surface so you can’t see the ridges. ‘Days In The Sun’ really is a beautiful colour, definitely try it again with 3 slightly thicker coats. 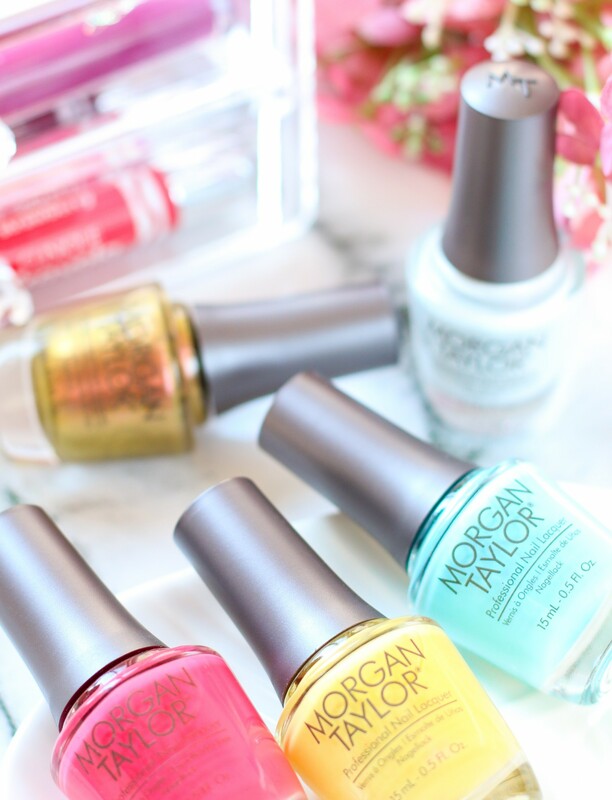 I love Morgan Taylor nail polishes, they’re definitely 1 of my top 2 nail polish brands. Plus I find their nail polish brushes are so easy to use, and makes application go a lot faster too! Hi L – it does look better to see the swatches on your actual nails. We know that it is extra effort and work, but it really does give a better idea of the actual colour (especially as your skin tone is similar to mine)! I totally agree with you. So beautiful on the nails. I personally think the swatches on the swatch sticks are just as useful as those on your actual nails. Your pics look beautiful but I don’t think it’s worth the extra effort. Great post as always! Will there be any more products popping up posts? Those are my faves! I definitely prefer the swatches on nails, it looks more professional imo. Thanks for the great review, Luzanne. I just bought the off-white one at Dischem during my lunch break. i bought the mini pack, because really, how could i not? and i am extremely disappointed. potts of tea looks so beautifull and even with 3 coats looks terrible , dries with bubbles and chips immediately. highly disappointed, considering i could have purchased 8 full sized essence polishes for this price of 4 minis. i dont know why i never learn my lesson with morgan taylor. Now that you mention it, yes I also found it chipped really quickly. I meant to take a pic as I used MT base and top coat as well. Literally I got maybe 2 days and then chips. I’m wearing The last petal today so I will see if this one also chips like the others did. 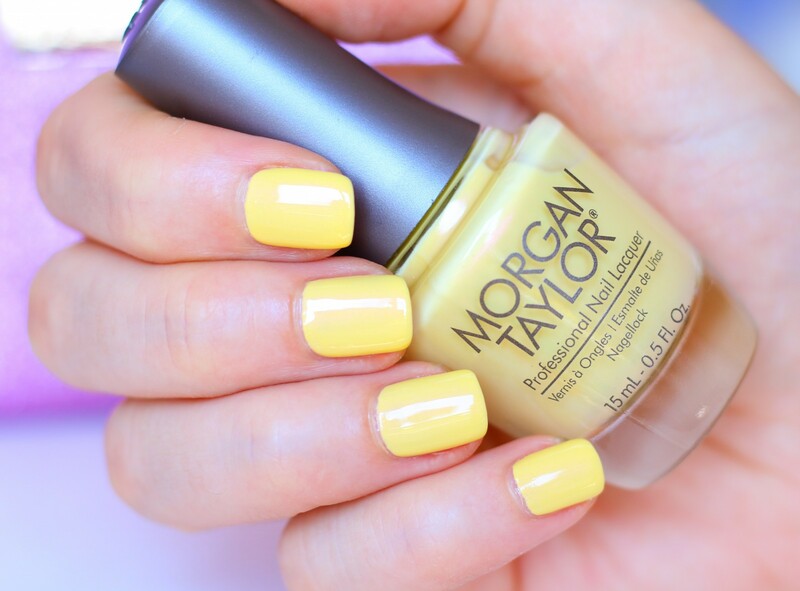 Love Morgan Taylor polishes, best brand!! Onthou jy die NBS advertensie met die pappegaai wat sy kop skud en sê : yes yes yess nbs … Wel dis hoe voel oor die blog post!! Eerstens – swatches op regte naels – waaaaaaay beter! Oh yeah, I need that baby blue one in my life!!! Flippet, daai naellak kleure is bitter mooi! Hou netso aan, ek verkies die kleure op jou naels, die swatch stokkies kan partykeer bietjie boring wees. Swatch sticks vs nails is a hard one, just because of the time involved. The nail swatches do look way more amazing. May have a lot to do with the fact that you have great nails! But I don’t think any of your readers would feel cheated if you used the swatch sticks instead.. My suggestion would be to see how much time you have to dedicate to the post/product or possibly doing your favourite colour on your nails and the rest on swatches! I really love this blog post! I was laughing at that “liver disease” comment 🙂 My personal favorite is definitely the Be Our Guest pink. Thank you for taking the time to show us how the nail polishes look on your hands absolutely a winner. Keep up the good work Luzanne. Haha! It’s true, I have to be very careful with yellow shades on my nails (that’s why I only own 1 other yellow nail polish). Die swatches op jou naels lyk baaaie beter as die stokkies. Mens kan jouself indink in hoe dit by jou naels gaan lyk. Ek weet dis baie moeite en ek waardeer dit. Jou arme man wat al die cutex en cutex remover stink moet vat! Haha, die mans kla altyd vreeslik oor dit. I know I am a year late on this, but your page came up as a search result when I was Googling the Potts of Tea colour 🙂 Thank you for doing the swatches on your own nails, it’s lovely to see the colours against a skin tone that is similar to mine instead of just on a plastic stick as it helps me visualise the colour and finish much better. Lovely blog in general too!